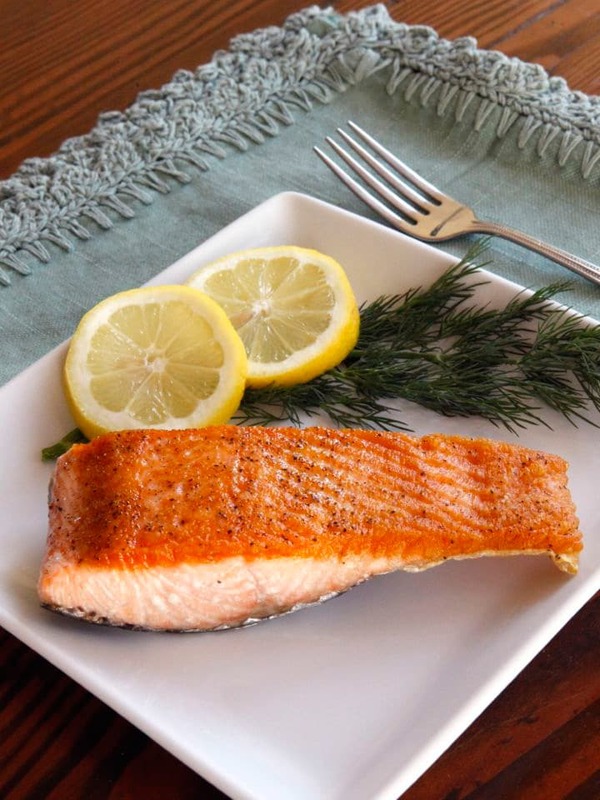 How to Sear Crisp, Moist Salmon Fillets – Make restaurant-quality salmon in your own kitchen! Golden crust, moist & flaky within. Fast, easy tutorial, 20 minute meal, healthy & delicious. It all started when my stepdaughter, aka “the pickiest eater on planet Earth,” developed a taste for salmon. Once I discovered she liked this healthy food, I was determined to perfect my salmon-cooking technique. She preferred the salmon served at one of our favorite local restaurants– it was pan-seared, moist and flaky with a crisp golden crust. After struggling to make it the same way at home, I finally landed on a technique that produces restaurant-quality salmon every time. And my stepdaughter? She now likes mine better than the restaurant version! This technique involves a simple combination of pan searing and oven roasting. Use boneless fillets, skin on or off– either will work. By following this recipe, you can have perfectly seared salmon fillets on the table in less than 20 minutes. Roast some veggies, steam a little couscous, and you’ve got a healthy, satisfying meal. Restaurant? We don’t need no stinkin’ restaurant! Give yourself a pat on the back and a Michelin star, you’ll be rocking salmon fillets like a boss from now on. Make restaurant-quality salmon in your own kitchen! Golden crust, moist & flaky within. Fast, easy tutorial, 20 minute meal, healthy & delicious. 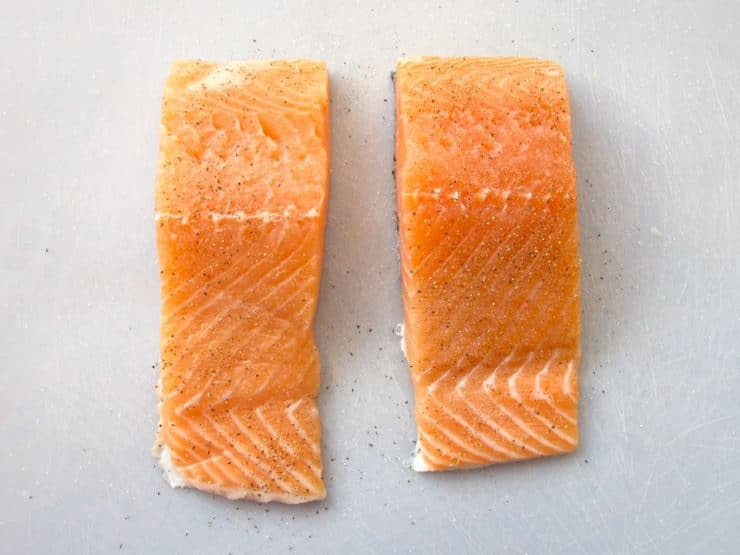 Preheat oven to 425 degrees F. If you have time, let the salmon come to room temperature, it will cook faster and more evenly that way (but don't stress, when I'm in a hurry I do it straight from the fridge). Sprinkle salmon fillets generously with salt and pepper. Place skillet on a burner over medium high heat for 3-4 minutes till drops of water sizzle and bead on the surface when you sprinkle them. When water dries pour 2 tbsp oil and swirl around the bottom of the pan to evenly coat. Oil will begin to smoke lightly after a moment or two. Place salmon fillets gently into the skillet, up to 4 at a time (depending on the size of your skillet), making sure not to crowd the pan. The fillets should not touch. 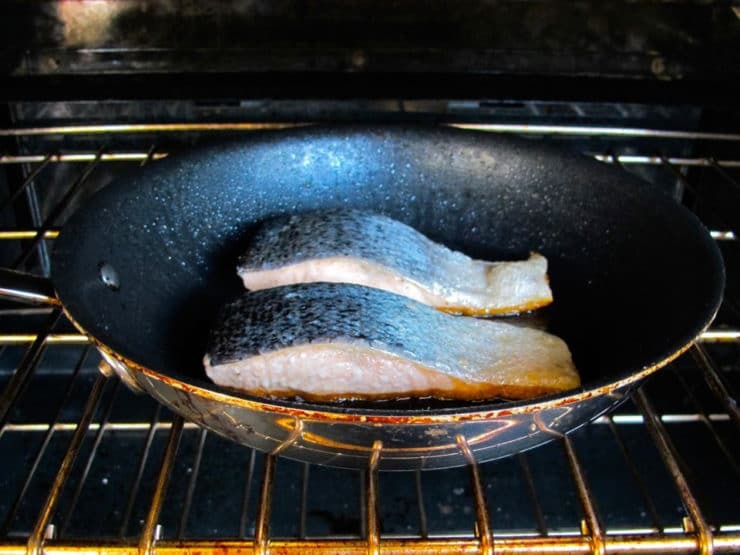 If using skin-on fillets, the skin should be facing upward, with meat against the pan. Turn the heat to high. Let the salmon sear for 2-3 minutes till a golden brown crust begins to form on the bottom edge of the meat. You'll be able to see the crust starting at the edge where the meat touches the pan. Once you see that, there is no need to lift the salmon and check-- the crust will continue developing in the oven. The less you disturb the salmon during cooking, the better. At this point, do not turn the salmon. Instead, transfer the whole skillet to the preheated oven. Let the salmon continue roasting in the oven for another 6-10 minutes. How long it cooks will depend on the thickness of the fillets and desired doneness-- some people like salmon a little on the rare side. Our family likes it fully cooked and flaking, but still moist. For a fillet that is 1-inch thick at its thickest point, this usually takes around 7-8 minutes in the oven. Once cooked you can cut into the thickest part of a fillet with a sharp knife to make sure it's done to your liking. 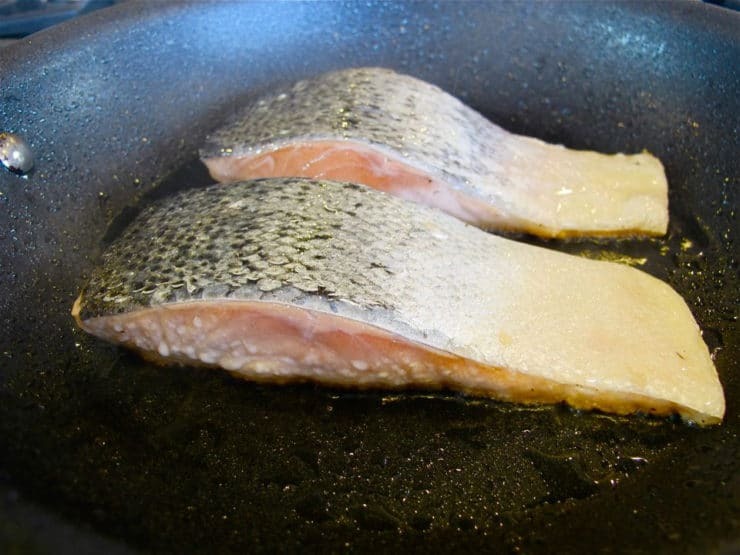 When the salmon is done roasting, use an oven mitt to carefully remove the skillet from the oven. I do mean carefully, the skillet will be hot and the oil will be sizzling! Remove the fillets from the pan carefully with tongs, plate them crust-side up, and serve. Keep in mind that if you keep them in the hot skillet they will continue to cook. If you're not serving the fillets immediately, you might want to take them out of the oven a little under-done and leave them in the hot skillet to finish cooking before you serve them. If you've left the skin on, it will be crisp at this point. Skin off, the only crispy area will be that golden brown crust. My stepdaughter likes that part the best. Enjoy! I can’t wait to try to recipe, but don’t have a cast iron or nonstick skillet. Can I use a dutch oven to without the lid for both on the stove and in the oven? Thanks! Hi Alice– yes, if it has a nonstick surface and heat-safe handles. Seriously the best way to cook salmon- I share with all my friends and family! Simple recipe, I’ve made it twice and it turned out perfect twice. I’ll never cook my salmon any other way. Thank you! My salmon turned out perfect. This is the only way I’ll cook it from now on, thank goodness it was so simple. Thank you! This recipe came out perfect! I was so upset that my crust was a little stuck to the skillet afterwards, so I couldn’t get all of the crust 🙁 what do you suggest so that it doesn’t stick next time? More oil before I put it in the oven? Hi Shanai, glad you liked it! 🙂 Did you use a nonstick skillet? That’s key here. If yes, I would suggest upping the amount of olive oil on the initial sear, making sure to fully coat the bottom of the pan. Sticking can also occur if the heat isn’t high enough at the beginning of the sear, so make sure it’s a nice hot pan in the beginning which helps to seal the crust and create the crispy finish. This recipe was spot on fabulous. I used a well seasoned cast iron skillet and the crust was beautiful. Won’t cook salmon any other way from now. Absolutely fabulous! I used your cooking instructions on my citrus grilled salmon, and it was the best I’ve made yet. Thank you! 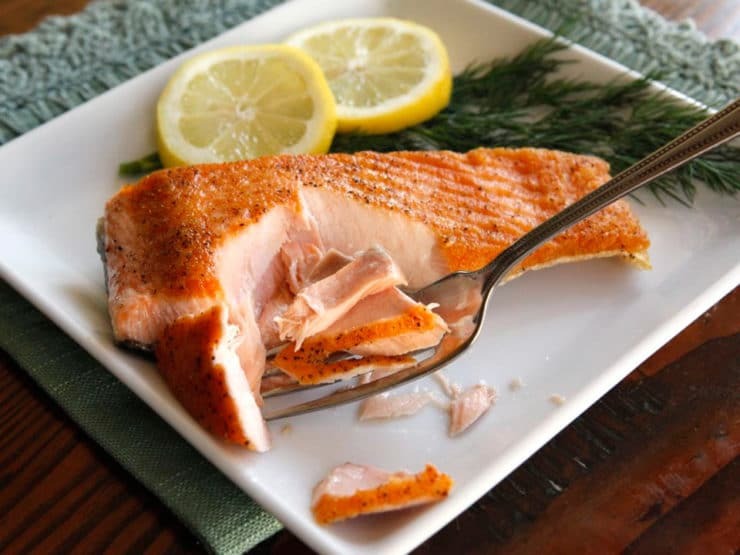 Best king salmon recipe, so easy. This was so easy and delicious! It will now be my go to salmon recipe. My kids, who always complain about eating fish, both ate twice as much as they usually do, and with a smile! It’s a small miracle. I made this today and it was fantastic!! My friends loved it!! Did it just as you said to…cooked it a little longer by accident but it wasn’t dry. I cook my steak this way but hadn’t tried Salmon. The one I was doing was loaded with butter and olive oil. This was simple, healthy, beautiful and delicious!! Thank you for posting this recipe!!! Perfection! I’ve made salmon for years and could never match the look and taste of high quality fish restaurants. I’m in 7th heaven!! Also used cooking method for Steelhead trout, also marketed as Steelhead salmon. I really want to try this, but I was wondering if you could apply this method to a type of salmon that’s thinner/less fatty, e.g. a Sockeye filet. If so, would I need to adjust the cook-time both on the stovetop and in the oven, or just shorten the time it’s in the oven? Thank you so much for your help, so many of your recipes have become household favorites! Hi Sarah! You certainly can, but you need to keep a close watch on it, as thinner fillets cook much faster and have a tendency to get dry rather quickly. I use this method with thin seabass fillets as well. If they are very thin you can skip the broiling step and simply pan-fry them. If you brine the salmon for 30 minutes beforehand, ratio 1: 4 salt to water, no white protein! I love doing this. I have followed your recipe many times, and it has been flawless. Tastes great with a nice crust, and the easiest to follow as well- how great is that? I use a Calphalon pan, and I confess that I adjust two things: I remove the skin first since some picky eaters don’t want to deal with it, and frankly, it still comes out great. The only other thing is that occasionally I add a few other seasonings depending on mood, perhaps a touch of dill and/or a hint of drizzled honey on top before going into the oven. But thanks again for a spectacular recipe that makes eating salmon at home enjoyable again! Thanks for this great recipe. I’d had no luck with salmon before. Again, thanks for the recipe, and for the site. Thanks, I keep coming back to this way of preparing salmon via search, it really works, time to bookmark it. My comment earlier should be five stars not two. So sorry a mistake. OMG! I followed the recipe as stated and this was excellent. I love it, but it never taste like restaurant salmon. Now; it is even better than. Following your recipe tonight, I made just about the best salmon ever — and at home! Thanks! Thank you, Tori! I made this tonight for dinner and it was delicious. I have never had good success with salmon, but this method worked well and I enjoyed it. Thanks again! I’ve made this several times. After the first time, I bought the pan that was linked (Amazon), and love the pan. I love to cook, and have a Traeger smoker, which I often use for cooking fish. The thing I love about this recipe is the simplicity of it. I often get wrapped up in extensive prep work and stuff.. which can be fine if you have the time… but after a day of work, this is easy to have prepped, cooked and on the table in less than 20 minutes, and it’s delicious.. the crust adds a great texture and flavor,.. it’s so easy, it’s crazy. Thanks for sharing!! I agree! This is one of our go-to weeknight meals because it is easy, healthy and so tasty. Glad you’re enjoying it like we do! I have made this twice in the last two weeks. We love it! I used one TBS of bacon grease and no olive oil. Totally delish! Made this salmon last night. OMG!!! Best salmon ever, and I’ve been cooking a long time. Was always wondering how to get the crust on top like the restaurants do, and now I know!! Even my husband loved it, and he is not a fan of salmon. I also learned the proper way to heat and use a cast iron skillet! Thank you so much!! Now I’m going to check your website for other delicious recipes. Happy to hear that Tobey! Just made this for dinner tonight. 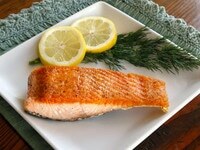 Hubby and I agree, this is the best salmon recipe we have tried. Fantastic crust, moist inside but not oily and so quick. Thank you, will definitely add to our dinner rotation! The first time I’ve ever made perfect salmon! I will forever always make salmon this way. Unbelievable crust. It is delicious. Thank you for the recipe! I was just google easy salmon recipe and came across this one.Oh Yeah!!! I tried it .lived it. you the salmon is perfect.I I usually cook without skin so it would come out right.I kept the skin on and followed the instructions.Its perfect,moist and tastes good. Reliably good! I’ve made it this way three times now, and every time it’s spot on. I’m so grateful to have a consistent way to cook a favorite. Thanks! This method is PERFECT. My husband gets so excited whenever I make this, though the frying step tends to set off the smoke alarm. Thank you for the great instructions! I’ve found that letting the fillet warm to room temperature yields the best results. Just tried this recipe tonight – with the skin on. It was delicious – but my smoke alarm also went on , and my perfectly clean oven now needs a good cleaning. Bit of a production – but it was worth it. Thanks for the recipe! Just what I am looking for but I want to do this for a large number of guests so could I do the searing and transfer to oven later? Hi Irene, Tori’s assistant Ashley here. You could give this method a try, but I can’t guarantee that you will have the same results as you would with following the recipe as written. If you do give it a try, please let us know how it turns out. Hi Alia, Tori’s assistant Ashley here. The salmon is cooked in an oven safe skillet the entire time. It is first cooked in the skillet on top of the stove and then transferred to finish cooking in the oven. It should never be cooked on the bare stove top. For the very first time my salmon came out absolutely perfect! Thank you!! Wonderfully simple and smashing perfect recipe! Thank you so much for sharing this. Nailed my first attempt at cooking salmon fillets thanks to you! Excellent recipe. Thank you…. the oil variation I would add, would be. Extra Virgin Olive in pan, Filet side down. Spoon skin 3–4 times before oven. Truffle oil drizzle when done to add flavor. hands down the baddest, most delicious way to go about producing a heck of a salmon experience! Thanks!!!! I need more stars ???????????????????????????????????????????????????????????? OMG!!! Thank you for sharing how to properly cook salmon – my whole family absolutely LOVES this recipe ???????????? This was such a good, simple recipe! This salmon came out great and so well flavored and tasty. I added a bit of garlic powder along with the salt and lemon pepper (I’m basically addicted to garlic), it came out beautifully! I made this with skinless, wild-caught Pacific King salmon and it was amazing!! Recipe is definitely a keeper. I used a sparing amount of Canola oil instead of olive oil because my experience with olive oil is that its smoke point is too low for searing and sometimes if the olive oil burns a little, you get an off taste. Regardless of oil choice, this recipe is really delicious, easy, and the presentation makes you look like a pro chef! I often combine butter AND olive oil in the skillet. They both have very low smoke points. However the combination of the two raises the smoke point sufficiently to sear meat and fish. The butter adds an additional level of complexity to the finished dish. I have been looking for a easy salmon recipe and this is it. Quick, EASY and perfect everytime. Thanks so much for sharing. I grill all meat. This is the only meat I do not. This recipe will make you a super star. It works perfect and you will get compliments. I love it!! Well, I’ve not tried this recipe yet, but about to tonight! Goal is a marinated Salmon salad, stove-top to oven, over a plate of arugula and other salad greens, goat cheese, a bit of balsamic vinaigrette followed by a delicious drizzle of balsamic glaze over all. Unfortunately, I do not have a cast iron skillet so will have to improvise with my T-Fal. Hope it went well Mary! Just make sure your skillet has an oven-safe handle that can stand the high heat. Although I cook a lot I do not make fish (can’t stand the smell). This recipe is fantastic and easy (and not smelly). I have even seared it and finished cooking it on the grill. Now it is my ‘go to” fish recipe. The best part is that you can make this for one person and it takes no time. Excellent instructions! My gas stovetop gets very hot, so only 1-1/2 minutes was needed for the sear. Thanks!! I am a firm believer that simple fish recipes are the best. This proved me right. I never liked salmon–tried it in Alaska and Seattle. This is great! Will do again. What a great technique! I tried this tonight and our salmon turned out PERFECT. Thank you for sharing! Omg this salmon is so good I feel like a chef thank you so much for this recipe my new favorite and it’s healthy. Normally when i make salmon i simmer it in a dill sauce, because any other way it comes out dry. But when my husband grabbed the salmon he forgot the stuff i needed for the sauce. So i hit google, because i didnt want to eat dry salmon and found this. 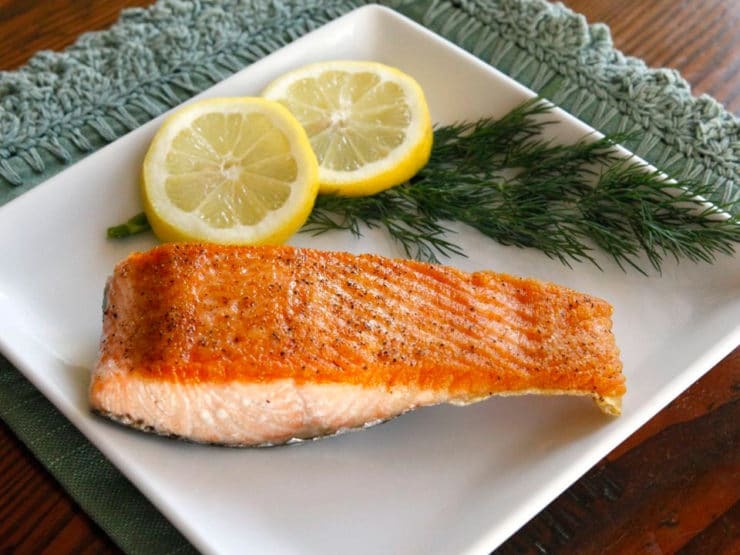 One of the hardest things when preparing a meal for your family….making something everyone likes, and the 2nd making something healthy that everyone likes…..well right now they are asking for seconds, but apparently the only thing my husband did wrong was not get enough salmon…..NEW FAMILY FAVORITE! THANK YOU. I added lemon, garlic, and dill to the tops of the fish. Then I seared the filets 2-3 min in my preheated cast iron pan. After that I tossed them into the 425 degree oven for 8 minutes. They released PERFECTLY from the pan, spiced intact, and tasted DELICIOUS!!! I’m so happy I found this new way to make my salmon ? A brief anecdote about my history with salmon follows ? Made this with a honey ginger glaze: 1 tablespoon each soy sauce, honey, melted butter and grated ginger, 1/2 tablespoon each olive oil and toasted sesame oil and 1large clove of minced garlic. Marinated the fish 30 minutes, then continued with recipe, brushing fish with remaining marinade before transferring to oven. This was great! I also am picky about my salmon. I like pan seared, but could never get the crisp and juicy on the stove like they do restaurants. Some restaurants couldn’t get it right either. I googled pan seared then oven and got this recipe and tried it today and It’s a hit – yummy!!!! I agree, this was great! I had been able to get a crust on the salmon by searing it but it almost always dried out. This recipe was perfect! Finishing it off in the oven did the trick. Nice sear on the salmon yet still moist on the inside. I will definitely be fixing this again. Thank you!! This was awesome. Thanks so much, my salmon came out, juicy and crispy. The only way I made it different as a personal preference, I used butter instead of oil and added rosemary and garlic to the seasoning. I love the sound of this recipe, but my oven broke, so I cannot try it out yet. For those like me, who might not be able to bake, I thought I would share my tip for making perfect skillet cooked salmon. First, I turn the heat on in the pan and add one to two tablespoons of olive oil to the pan. I put the heat on medium to medium high, about a 5 or usually a 6. I pan sear the salmon skin side up, until the fish starts to brown, for 2 to 3 minutes, as long as it takes to get a little caramelization. Then I turn the salmon over, pour in water, and braise it until it is firm, about 5 to 7 minutes. I personally like it with dill and capers, so I add them at this point. Onice the salmon is (MOSTLY) cooked, I remove it from the water and put it on a plate. The secret here is to NOT cook it until it flakes. At this point, I remove the fish to a plate. I take the capers out of the water and set aside. I then pour out the water, and put a little butter in the pan and place the fish back in the skillet, skin side up – to finish cooking and brown a little more, about a minute or two. When I plate it, I garnish with chopped fresh dill and the whole capers set aside after braising. My family loves this dish, and it always turns out great – you just have to watch it carefully while it is braising, to avoid overcooking it so it doesn’the fall apart when you remove it from the pan. I use a large spatula when I need to flip it over or move it out of the pan, careful to handle it as little as possible. When flipping over, I do it gently, holding the salmon on top with my fingers, so I have more control when turning it. OMG! For the first time we acquired golden brown salmon as we has aspired to. It was picture perfect and guest worthy! We used butter and a cast iron skillet. I did a search for, seared oven finished, and here I landed. This was extreamly simple and the salmon came out perfectly. Little over an inch thick filet, in a good large nonstick. I was amazed how perfect it came out, as good as a place I worked that sold it for 15 a lb. perfect crust! Now I’ve got to figure out the honey ginger glaze they made. Big thanks for sharing, it should be a secret that it is this simple! I made this tonight with the following honey ginger glaze…it was fabulous! Combine all ingredients, marinate fish 30-60 minutes. Continue with recipe basting with remaining marinade before transferring to oven. Did you use ginger in your honey ginger glaze? If so, how much, I’d like to try this. this is brilliant. my salmon was perfect and it took no effort. thanks so much for sharing! This method is the best way to cook salmon that I’ve ever tried and I have cooked a lot of salmon. Perfect! Just tried tonight (new years eve). Omg….so crispy, so flaky, so good!!! Perfect recipe. Thanks! I found this recipe a few weeks ago and tried it. My daughter loves it and has requested it several times since. My husband is anti-salmon no matter how it’s cooked. He dislikes it all. After the first attempt at this recipe, I suggested he try it. He did and said “For salmon, that’s really good.” Congrats on the fantastic recipe! This is exactly what I was searching for! Excellent directions; precise but simple. Just got news of a health issue we need to address through diet & wasn’t especially looking forward to fish. Just what the Dr. ordered & delicious. Many thanks! I always sear flesh side down for a couple of minutes and then flip it over so it’s skin side down before popping in the oven. I (and my dog) happen to enjoy the crispy skin. I tried this recipe last week, and it turned out absolutely DELICIOUS. I traditionally make my salmon with either lots of garlic and Dijon mustard OR lots of garlic and Maple Syrup (can you tell I love garlic?) – would this recipe work if I added these items, or would they just burn in the bottom of the pan (mostly concerned about the garlic – but open to leaving them out)? I can’t wait to make it again, but looking forward to experimenting with flavours! Any advice would be appreciated. Hi Diane, Tori’s assistant Ashley here! You can certainly experiment with this recipe, however I would keep a close eye on the heat, particularly when using maple syrup since sugary substances are more likely to burn. Hope this helps! I’ve made this recipe over and over again, and it’s probably one of my favourite fish cooking techniques now. So many things you can do with it, and it always comes out perfect. Amazing! The perfect salmon recipe! I admit the first time I tried I over-cooked it by far. That was my fault though. 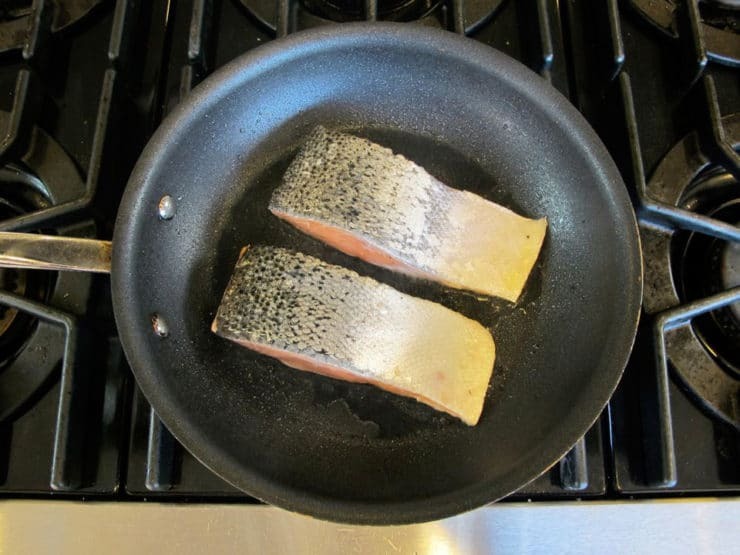 Alaskan Salmon cooks faster than farmed salmon and it also cooks faster in cast iron. Instead of adjusting my time/temp I went ahead and switched out to a regular pan the next time and then baked at the lower end of your minute scale. Fantastic! My new go-to salmon recipe. Living in a fishing village, we eat a LOT of salmon in our house. This was the first recipe m6 husband has truly been impressed with. Score! This is my favorite go to salmon recipe. Incredibly easy and always comes out delicious. Sometimes I replace the olive oil with a sliver of butter! Thank you for sharing. Amazing!! So easy to cook and absolutely delicious! And when those beautiful filets came out of the oven with that beautiful golden crust and were so moist inside, I felt like a chef. I will never cook salmon any other way. I have seared salmon so many times that I don’t know why I looked up this recipe, but I am so glad I did. The best it has ever turned out and exactly as pictured. Used cast iron and followed directions exactly. Perfectly cooked inside with a nice crunch outside. Thanks. Hi Tori,,This recipe is wonderful! Thank you for simple recipe…I used lemon on mine w/pat butter. I am a terrible cook ( I have fun but no technique) and this came out GREAT! I would definitely make again. Thanks! btw I used cast iron skillet 3 minutes on high on stove then put in 425 degree oven for 6 minutes and flipped and cooked for remaining 2 minutes. 5 stars does not do its justice here! It is very easy to follow, healthy, simple, ordinary ingredients, quick prep & cook times, consistent …..oh & DELICIOUS!! !